So I was off on a post-Labor Day vacation in Florida and now that I’m back I thought I’d compile a list of the wisdoms I gathered during my travels. Because let’s face it, it takes a brave person to visit the Sunshine State during hurricane season, and an even braver one to spend early September in the heat-ridden oven that is Orlando. 2. You can’t buy a breeze in these parks. And somehow it is hotter in the Mexico-themed country of Epcot than any other country there. Freaky. 3. Do not fall for the Chronicles of Narnia ride at Hollywood Studios. Actually, the DH and I have nicknamed it the “Commercials of Narnia,” because the entire “ride” is you standing in a room watching a 15-minute movie trailer. That’s it. Then you leave. It was insulting. 4. 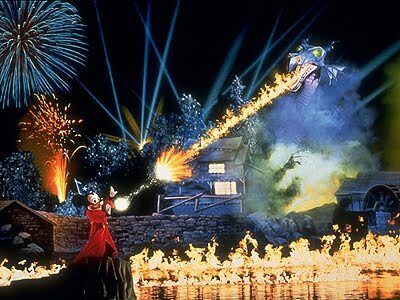 See the Fantasmic fireworks show. It is so awesome, the DH spent the rest of the trip practicing his wand-waving in case his dying wish of being cast as Mickey during this show is ever fulfilled. 5. The “American Adventure” video in the Boston-themed part of Epcot takes itself very seriously. And it’s like 40 minutes long. By the time we got to the very dramatic ending, I had to work hard not to laugh (especially when the image of Tiger Woods came up). 6. Go to the interactive “Turtle Talk with Crush” experience at Epcot. The guy playing the Nemo turtle is “totally” hysterical, and I still have no idea how that animated character on screen was able to respond to the crowd. Righteous. 7. If you volunteer to be on stage during the Backlot Tour, they will dump a few tons of water on you. Seriously. And that raincoat they give you doesn’t really stop your jeans from being wet the rest of the day. 8. Full grown men can go down the waterslide at the gigantic pool in the Beach Club resort. They don’t get stuck. 9. I think the same woman sings all the “dramatic montage” songs in every country. And you will find yourself begrudgingly humming “Canada! Oh, Canada!! !” for days afterward. 10. Dress socks with little Mickey heads make an excellent gift for your cat sitter. So Andy Reid has recently named Michael “I Kill Dogs for Fun” Vick as the starting quarterback for the Eagles for the rest of the season, benching Kevin “The Future of the Team” Kolb until further notice. Kinda harsh. Kolb only played one half of one game before his concussion, and granted, it wasn’t a very good half, but still. I thought they would at least give him another try. I’ll admit Vick played some awesome football these past couple weeks, but Detroit is a sucky team. He might as well have been playing against my old high school. 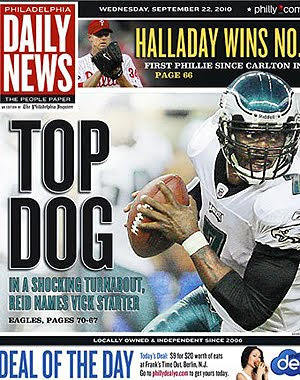 And as much as I think Vick is the better quarterback, I find it hard to support anyone who is capable of torturing dogs for kicks—though I am looking forward to all the headlines the Philly Daily News will dream up. This one is pretty classic.